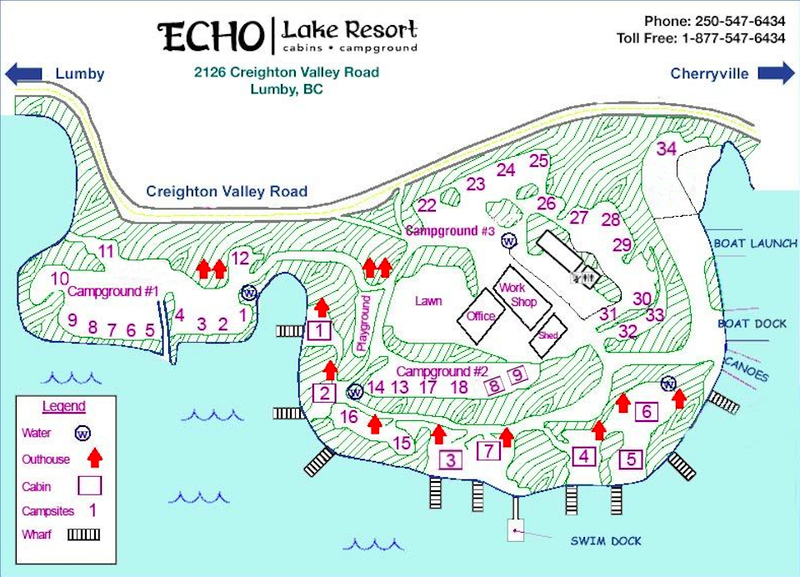 Echo Lake Resort has 35 campsites, each with their own picnic table and firepit. From un-serviced tenting sites to powered RV sites, we have something for every kind of camper. Our waterfront sites, each with their own private beach area, are a favourite for kids and adults alike in the hot summer season. For those who like to relax in the shade, our lake-view and forested sites are perfect, and a few even have a private dock for your fishing boat. For your convenience, the on-site facilities include a clean and spacious washroom building, with flush toilets and hot pay showers. Outhouses are available for those who insist on the full camping experience. Ice, firewood, basic groceries and smore fixin’s are available in the Resort Store. We have potable water taps and fish cleaning stations situated around the resort so you can enjoy your fresh catch for dinner. We offer a quiet time starting at 10PM so families can get a good night’s sleep and the owners live on-site in case of any emergencies. We do require a two night minimum booking during the shoulder seasons, and a three night minimum booking during long weekends and peak seasons.